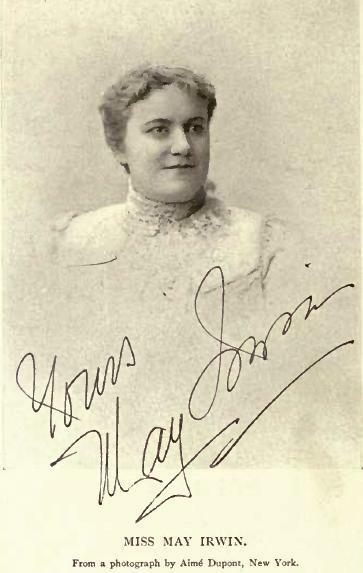 May Irwin has been credited with the very first film kiss which caused outrage at the time. Born at Whitby, Ontario in 1862 as Georgina May Campbell, her father, Robert E. Campbell, died when she was 13 years old; her stage-minded mother, Jane Draper, in need of money, encouraged May and her younger sister Flora to perform. They created a singing act, billed as the "Irwin Sisters," that debuted at the Adelphi Theatre in nearby Buffalo, New York in December 1874. By late 1877, their careers had progressed and they were booked to appear at New York's Metropolitan Theatre, then at the Tony Pastor Theatre, a popular New York City music hall. The sisters proved popular enough to earn regular spots for the ensuing six years, after which 21-year-old May set out on her own. She joined Augustin Daly's stock company from 1883 to 1887, where she made her first appearance on the theatrical stage. This comedienne was known for her improvisation skills. An immediate success, she went on to make her London stage debut at Toole's Theatre in August 1884. By the age of 25, she was earning $2,500 a week. In 1886, her husband of eight years, Frederick W. Keller, died unexpectedly. 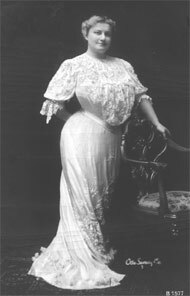 Her sister Flora married New York State Senator Thomas F. Grady. Among her own pieces have been " The Widow Jones", " The Swell Miss Fitzswell", "Courted into Court", "Kate Kip-Buyer", "Sister Mary", etc. Irwin's buxom figure was much in vogue at the time and, combined with her charming personality, made her one of America's most beloved performers for more than thirty years. In 1914, she made her second silent film appearance, this time in the feature-length adaptation of George V. Hobart's play, Mrs. Black is Back, produced by Adolph Zukor's Famous Players Film Company and filmed for the most part at her own sprawling home in New York. Still pictures showing May survive from this movie. Thank you for sharing the story of a truly amazing woman. Obviously May Irwin was a true force in her world. I would imagine I'm not the only person who has never heard of her. Your love of history is showing and I'm thrilled! What an interesting woman! Thank you for sharing her story. I don't know much about show business during that time, but not you've pealed my interest!